In 1996 at just 14 years of age, Neil Robertson became the youngest player ever to make a century break in an Australian ranking event. At 14 he also won the Under-18s Australian Snooker title. This was a sign of things to come. 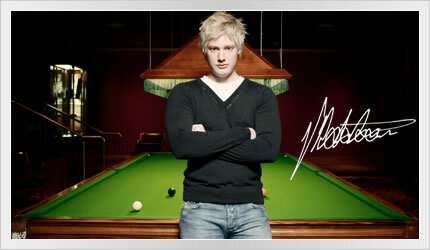 By the age of 16, Neil had turned professional, and reached the Last 16 of the IBSF World Snooker Championship. Those who knew the game, started to take notice. Unable to accumulate sufficient ranking points, and finding living abroad difficult, Neil dropped off the professional circuit and returned home to contemplate his future. He dominated the Australian snooker scene for several years with an unrivalled string of tournament victories and high breaks. But his desire to prove his talent against the world's best professionals continued to burn. Neil re-qualified for the international Main Tour professional series in 2003 by winning his first world title: the WPBSA World Under-21 Snooker Championship in New Zealand. It was during the subsequent 2003-2004 Main Tour season, that Neil truly made his mark on the world stage. After some promising results, including his first Quarter Finals appearance at a world ranking event, Neil finished the season ranked 68th in the world (provisionally 48th). By the end of the 2004-2005 Main Tour season, a further 2 Quarter Final appearances, and victories against some of the world's best players, Neil had climbed to 28th in the world (provisionally 13th). By the end of the 2005-2006 Main Tour season, and another 2 Quarter Final appearances, Neil had broken into the prestigious world Top 16, finishing with a world ranking of 13th (provisionally 12th). During the 2006-2007 Main Tour season, Neil became the first Australian to win a professional ranking snooker event, claiming the Grand Prix in October. He then became the only professional to win two titles in that season, by claiming the Welsh Open early in 2007. Neil finished the season ranked 7th in the world (provisionally 4th). Despite a difficult 2007-2008 Main Tour, Neil consolidated his position within the sport's elite by reaching the final group stages of the Malta Cup and Grand Prix, and the Quarter Finals of the Northern Ireland Trophy. Neil ended the season ranked 10th in the world. Neil returned to form close to his best during the 2008-2009 season, reaching the Quarter Finals of the Masters, the Semi Finals of the Welsh Open and the World Title, and claiming his third professional title, the inaugural Bahrain Championship, to finish the season ranked 9th in the world (provisionally 5th). Neil carried this form into the 2009-2010 season, winning his fourth professional ranking title, the 2009 Grand Prix, joining a small elite of professionals to have won 4 events, and also becoming snooker's most successful "international" competitor (a player originating from outside the UK). Regarded today as one of the world's best long potters and one of snooker's fastest rising stars, Neil is gifted with a well-rounded game, calm temperament and steely determination. 68, 28, 13, 7, 10, 9. Neil has steadiliy climbed the world rankings over the past 6 seasons, but the best is yet to come, and as always Neil sets the bar high. This profile was last updated in late 2009. The following year, Neil achieved both of the goals this profile refers to: in May 2010 he won the World Championship, and in September 2010 he achieved the World #1 Ranking for the first time. Neil continued to add to the trophy cabinet in October with the World Open 2010, then won PTC6 and PTC8 in October 2011, and won The Masters for the first time in January 2012. ... My homework is late!